At Enspira, we understand that your financial situation and your needs are unique. We have the expertise to help you get to your goals, no matter what stage of life you are in. The aim of this book is to bring together information that will assist anybody looking after your affairs when you are unable or can’t assist with this process. The process of filling in the Finances Handbook itself will provide you with a broad overview and better understanding of your affairs. The more times you fill in your handbook, the better you will get at writing out the information as well as adding more information. You may need to adjust the information you collect to suit your own circumstances. 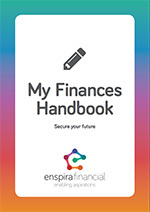 Click here to download the My Finances Handbook.